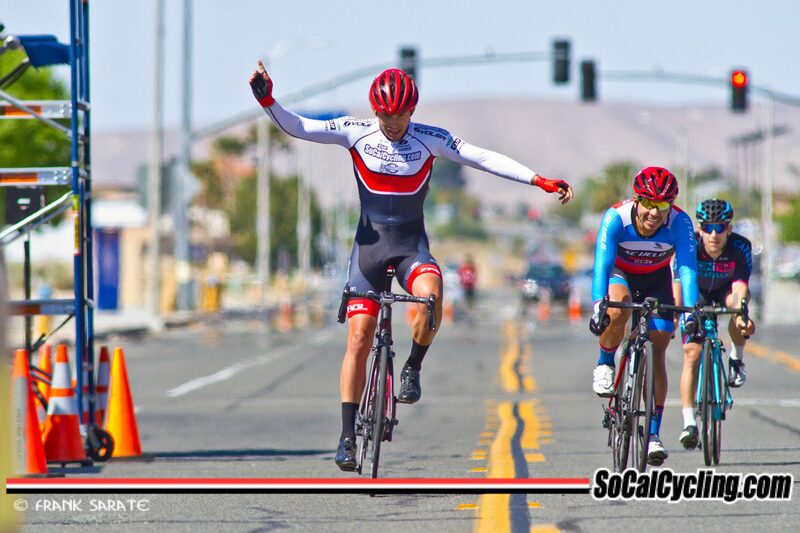 In the weekend just passed, the SoCalCycling.com Team and I attended the 2nd annual Victorville Omnium. The main goal of the Team was to continue our good run of Team results and see how we were tracking on our build up to Redlands. The 3 days of racing kicked off with a slightly alternative 10km Time Trial. The course had a bit of everything with some decently long straights, a testing technical section and a little climb to really work the lactic into the legs on the run in to the finish. After a solid training block in the legs during the weeks leading up, I was feeling ready to test my form. I kicked into the TT without much of a warm up after having to make some last minute adjustments, but despite having cold legs early on I warmed into it quickly and soon found my rhythm. Coming across the line I felt that I’d given it everything, but I wasn’t sure how my time would stand up overall. When the results came out I found I’d taken the win and would be leading the omnium going into the circuit race the next day. Being my first victory since landing in the U.S I was stoked after having a problematic start to my season. The 1st day was also a success for the SoCalCycling.com Team all round taking a clean sweep of the podium and taking out 7 of the top 8 spots after the TT. The circuit race was to be run on the same course as the TT and with strong winds forecasted it was going to be an interesting stage. With the points only decreasing by 1 for every place down the overall I was keen to cement my place on the top of the overall by putting in a strong performance in the Circuit Race. My team mate Callum Gordon and I hatched a plan between ourselves to attack the field straight from the gun and decided to keep the idea to ourselves. With the forecasted strong winds making an appearance, the plan worked even better than we could’ve hoped with our early 2 up attack (with team mate Leo Bugtai quickly joining the fray) causing chaos in the bunch. Within the first five minutes we had already splintered the field and by the beginning of the second lap our gap was out to 50 seconds. With the bunch scrambling to reform behind us and struggling to form a cohesive chase our gap continued to grow out to a maximum of 2 minutes 30 seconds as Leo, Callum and I forged onwards. After around 45km we ran into a hiccup with Leo’s front wheel sliding out from under him. I narrowly avoided going down myself, but this meant we were down to two men for the remaining 70km or so. The remaining kilometres were relatively uneventful as Callum and I continued to drive the pace while the field behind us continued to shatter under the intense pressure of the wind. We came into the finish with a solid gap taking the 1, 2 comfortably for the second day in a row. The severely reduced bunch of just 6 riders rolled in around 2 minutes behind us with team mates Cullen Browne and Michael Barker rounding out 7th and 8th. After our second consecutive 1, 2 in a row Callum Gordon and I were placed solidly in 1st and 2nd going into the 3rd and final stage, the Criterium on Sunday. Given my good form I was keen to push on for another good result to assert myself on the race. After lots of small attacks and extremely variable pace early on I chose my moment to put in a strong move quickly bridging to a 3 man break up the road including one team mate. Instead of waiting around to get organised I carried on straight past the break forming my own move that would eventually evolve into a 5 man break. Once the group of team mate Jason Cianfrocca, myself and one rider each from Aevolo, SC Velo and Centric was properly established and rolling we got our gap out to a maximum of 40 seconds. Although there were some interesting team tactics at play behind us in the pack I refused to give in digging deep allowing to gap to only drop to a minimum of 30 seconds. 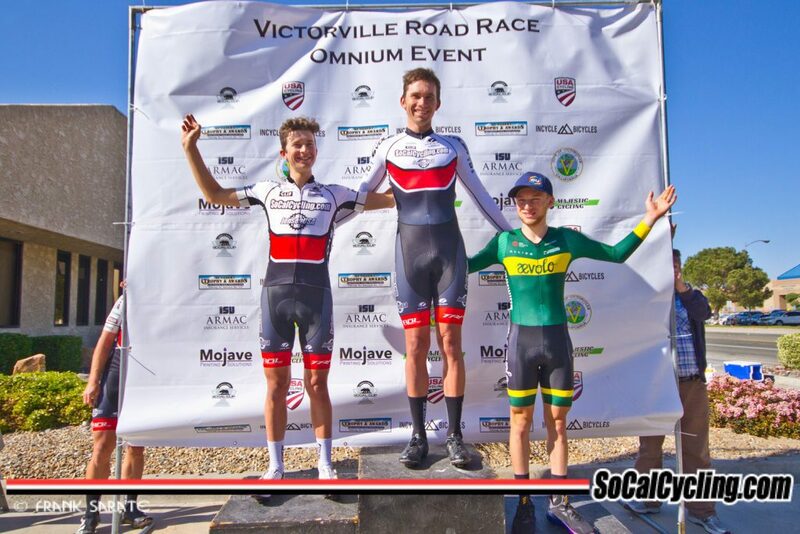 Being the marked man of the group I was forced into leading out the sprint from a long way out, but through pure grit and determination I was able to hold off a fast approaching SC Velo rider to take the victory, the threepeat and the overall for the 2nd annual Victorville Omnium. A big thank you to Jason for riding selflessly in the break helping me to get to the end with enough gas to finish it all off. I would like to say a big thank you to all our sponsors, supporters, race officials, organisers and team mates for an awesome weekend of racing. It would be impossible to do what we do without all your support. SoCalCycling.com, Jenson USA, Voler Apparel, Caravan Canopy, Clif Bar, FSA, Union Sport, ROL Wheels, TRP Brakes, KMC Chains, Fuji Bicycles, Julbo, Larsen’s Restaurants and Forze.